Samba-Reggae is a music genre that was created in Salvador, Bahia by Afro-Brazilians during the 1970s and 80s as an extension of the Black Pride movement. Through a mixture of Jamaican reggae and Brazilian samba, samba-reggae was born. The first bloco-afro to showcase samba-reggae was Ilê Aiyê, which was created in 1974 and was significant in returning samba to its African roots and identity while establishing a carnival parade in Salvador that Afro-Brazilians could call their own since Black Brazilians were not allowed to participate in the Rio carnivals. In 1979, the second bloco, Olodum, was led by Mestre Neguinho do Samba. Mestre Neguinho do Samba was also a former drum leader of Ilê Aiyê and he re-introduced the hand and stick style of playing the repinique drum. 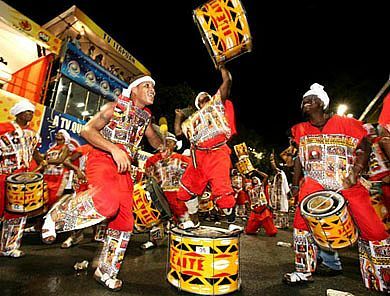 Following Olodum was Timbalada, which is an afro-bloco that was directed by Carlinhos Brown who brought back the playing of the timbal drum, which was nearly extinct. Because of these three groups, samba reggae bands such as Didá, Cortejo Afro, of course Batalá, and many others came into existence and created their own samba-reggae rhythms. Through Samba-Reggae (also known as Afro-Reggae), music genres such as Axé came along and until this very day samba-reggae inspires many people to create, live, and love. Listen to the sounds and watch the images in this documentary about the birth of samba-reggae. There are no English subtitles, but the music speaks for itself.